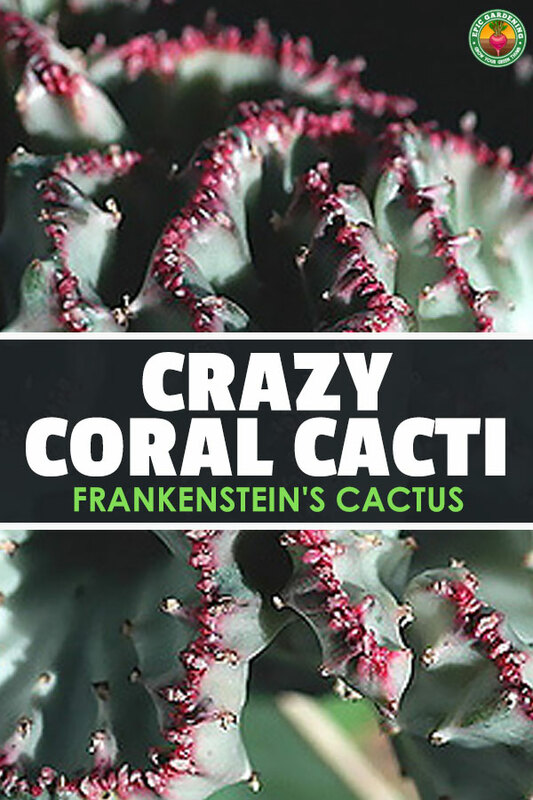 If Frankenstein’s monster were to take up gardening, he might find coral cactus to be his favorite plant. This melding of two succulent varieties into one unusual cactus-like plant is striking to see. Depending on the top crest, it may have a fan of white, red, green, yellow, or purple ruffled succulent growth on top of what looks like a medium-green “stem”. But this cactus isn’t actually a cactus at all, and if treated like one it can develop problems. Let’s figure out what this unusual Frankenstein’s Cactus-That-Isn’t-Really-A-Cactus needs to survive and thrive! With its origins in Africa, the Euphorbia genus is a surprisingly large family of over 2000 succulent plants. Commonly referred to as “spurges”, they’re known for their poisonous sap, called latex, which was once traditionally used as a purgative. 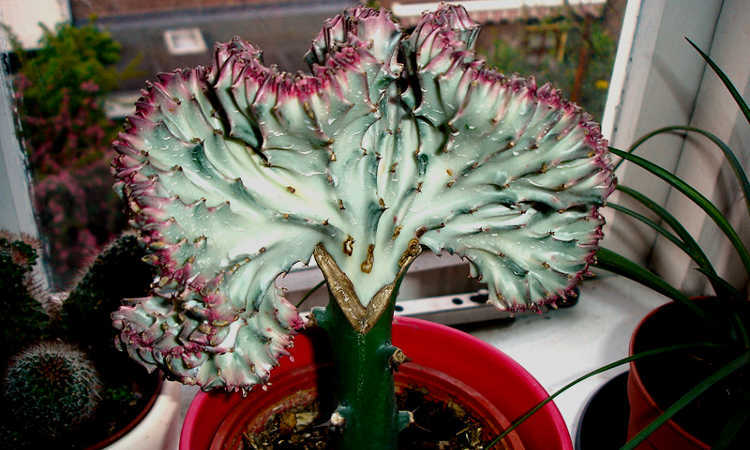 But the coral cactus is actually two different types of Euphorbias at the same time, which makes it a bit more complex. The base is usually Euphorbia neriifolia, a plant which looks cactus-like except for its wide, oval leaves. While occasionally other euphorbia species are used, this is by and large the most common due to its straight-growing tendency. But grafted to the top will be a crest from a different plant. 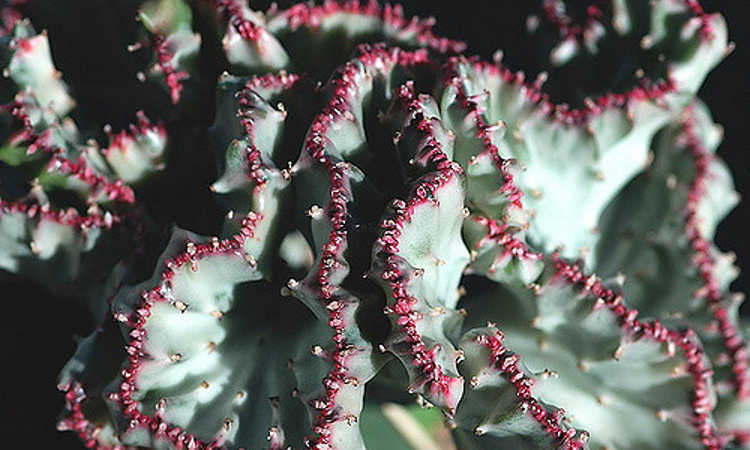 This is Euphorbia lactea, often the ‘Cristata’ variety, which has rippled large leaves that form a fan-like shape. Occasionally called the candelabra plant, the crested candelabra plant, crested euphorbia, or crested elkhorn, it resembles an unusual coral once grafted together. The edges of the ruffled and crinkled leaves may be purple, green, white, yellow, or red in hue, mounted on a very straight stem. Rarely, it can produce flowers, although this is quite uncommon at best. The coral cactus flower is tiny and not much to look at, but may be pink or purple in coloration if a flower appears. This usually only happens on older plants, but may never occur at all. The latex, or sap, of coral cactus is toxic and may be quite dangerous. White and thick, this sap can cause skin conditions such as dermatitis or other irritations. If it gets in the eyes, it can cause eye irritation or even temporary blindness. Ingested, it causes nausea or vomiting. This latex will dry clear, but may still be an irritant. It’s best to use gloves at all times when touching this plant, and if you must pick it up, either hold the pot or use barbecue tongs to carefully lift it without risking exposure to the latex. 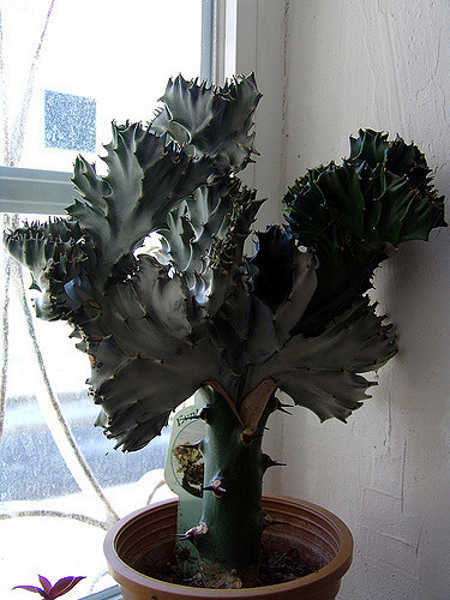 Like many euphorbias, both the crest and the base may have sharp spines. Those can also cause irritation, so avoid injury from them as well! If treated exactly like most cacti, your coral cactus may not be very happy in your home. So how do you care for this unusual concoction of a plant? By treating it as the Euphorbia mishmash that it is, of course! Coral cactus can be grown outdoors year-round in zones 10-11, but should be moved indoors in the cooler months in other regions. The ideal growing temperature for this particular plant is between 60-85 degrees. While it can be grown in full sun conditions, hotter areas should opt for partial shade during the heat of the day to avoid sunburning the plant. A new plant should be started in partial shade conditions and slowly trained to take more and more sun to allow it time to adjust. If grown indoors, opt for a window which provides good sunlight during at least 3-5 hours of the day, and turn it regularly so that your plant doesn’t begin to grow lopsided. Finally, coral cactus is not cold-hardy at all. It doesn’t like temperatures that dip down below the 50’s, and prefers to be in the 60’s and up. If your outdoor conditions start getting too cool, bring it indoors to a warmer climate. As a succulent plant, coral cactus is not at all frost or freeze-friendly – it will damage the fragile tissues of the plant and kill it! 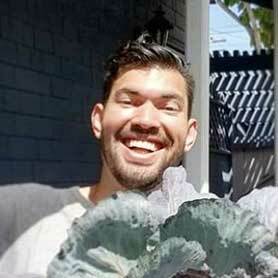 With most succulents and cacti, the golden rule to follow is: “when in doubt, don’t water”. However, you’ll find that coral cactus is a little trickier, as it doesn’t tolerate drought like a cactus actually would. At the same time, this plant really hates being in soggy conditions. If your soil is overly-moist, your euphorbia can develop problems like root rot. Begin by checking the soil moisture. If it’s dry in the top two to four inches of your soil, the plant is probably thirsty. Water the soil, but not the plant directly, until water runs out of the pot’s base. If your coral cactus looks droopy or wilted, it’s probably under-watered. This can cause damage to the crest, and it can develop fungal issues or rot if it stays that way for too long, so it’s important to avoid this condition whenever possible. Over-watering can also be a problem, as soil that remains too wet for too long can cause root rot and kill your plant. Always check the soil before watering! Typically, you will need to water your coral cactus most often in the spring and summer months when it’s actively growing. Fall and winter months reduce the watering frequency, as the plant doesn’t need as much water during those times of year. Even if it’s a little finicky about its watering frequency, you’ll find your coral cactus enjoys humid environments as long as they have good airflow. This makes them a good candidate for greenhouse or indoor growing, but keep a watchful eye out for signs of powdery mildew. 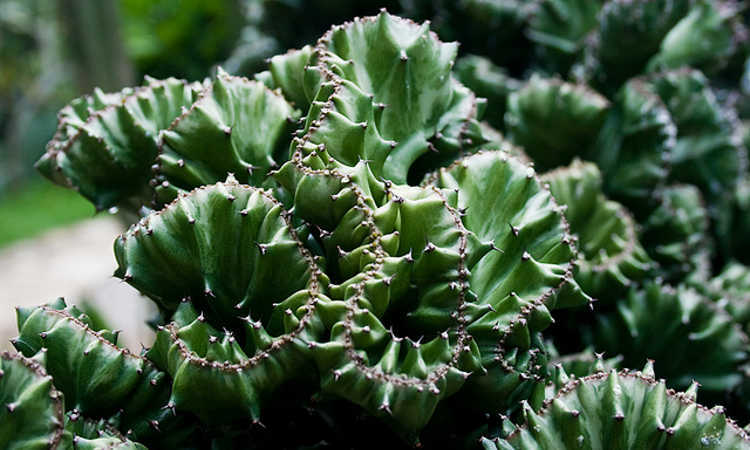 The average euphorbia species prefers a cactus potting soil or other extremely well-draining, gritty soils. They like a little organic matter mixed into the planting hole for added nutrition, but just simple cactus soil works extremely well. Coral cactus isn’t picky about the soil pH level at all, so the soil can range from slightly acidic to slightly alkaline without any real changes. Often, storebought grafted plants are mulched with gravel, and sometimes this is glued together to help support the plant’s base in transit. While this won’t harm the plant, it makes it quite difficult to determine if the plant needs watering. If you wish to mulch, it’s easier to remove any glued gravel from around your plant and replace it with a loose gravel that can be moved out of the way. Alternately, you can remove the mulch at all, but if it’s an outdoor plant, a gravel mulch can prevent weeds and rapid soil drying. During its growing season in the spring and summer, your coral cactus should be fertilized regularly. Use a 10-10-10 liquid fertilizer that has been diluted to 1/4 of its original strength (making it a 2.5-2.5-2.5), and fertilize every two weeks at most. It may require even less if you have rich soil. Avoid fertilizing your plant during the fall and winter months, as it doesn’t require the added nutrition then. Also avoid slow-release or granular fertilizers, as they can get up against the rootstock of your euphorbia and cause burning of the plant. Generally, euphorbias are propagated by cuttings dipped in rooting hormone, and very rarely by seed. But since the coral cactus is a grafted plant, you can only make more of them through grafting, which is a bit complex. Begin by selecting a healthy Euphorbia neriifolia and Euphorbia lactea var. cristata that you want to work with. Younger plants take to the grafting process much easier than older ones do. To pick, it helps if you look at the shape of the lactea’s crest and imagine it on top of the neriifolia’s base. Find a pair that looks like it’s meant to go together! You’ll need to cut a V shape into the neriifolia, removing the upper portion of the plant but leaving enough of the sides to help support the crown. 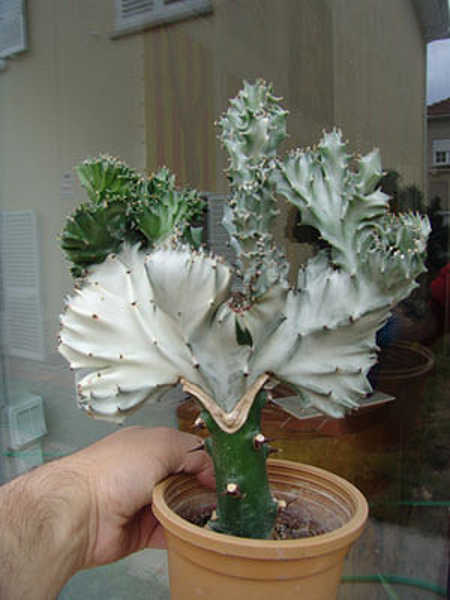 The euphorbia lactea crest will need an arrowhead-like shape cut, extending outward from the crest’s bottom to fit snugly into the neriifolia stem. Be sure that you cut to ensure a tight fit that has no open space. Open gaps between the two plants will allow sap to leak out and may cause fungal rots to form. Once you’ve placed your crest into the V of the neriifolia, use grafting wax to cover all the joining surfaces, keeping them sealed and clean. Be very careful during this process to avoid getting the sap from either plant on your skin. Always wear gloves. Use twine to tie the grafted joint together and help keep the Franken-plant in place. It’ll take 2-3 weeks minimum for the two plants to fully fuse together, and may take longer. After 3 weeks, carefully remove the grafting wax and inspect the joint. If it still looks as though it needs more time to heal together, put fresh grafting wax on and wait another 3 weeks and retie the twine in place to keep it secure. Be careful not to damage your joint! Coral cactus rarely becomes rootbound in a pot. When you first bring a grafted plant home, it’s a good idea to pop on the gloves and carefully slide the plant free from its pot to check. As long as it’s not rootbound, it should be able to live in that pot for quite a long time. If it does show signs of root entanglement, you can select a very slightly larger pot and replant in that, adding a bit more cactus potting mix as needed. Be sure that your pot has good drainage. Most coral cactus plants tend to be planted in terracotta or other “breathable” pots, which allows for any excess water to evaporate. Unfortunately, in hot conditions this also means they can dry out quicker. While these are great pots for your plant, be mindful of its water level. In most cases, coral cactus will never require pruning. The only exception to this is if the cactus develops a fungal rot, at which point it may already be too late. Fungal rots can strike either the crest of the plant or the roots. If you see signs of your crest browning or softening, this is usually a sign of the rot. If you are careful, you can sometimes do surgery on the crest to remove fungal-damaged pieces that are at the edges of the crest. Provided that you get all of the damaged part of the crest off, your plant should recover. Use a sterile razor blade, and wear gloves to avoid getting any of the poisonous latex on your skin. You don’t need to seal off the cut surface, as the latex the plant creates will create its own scab as it dries. 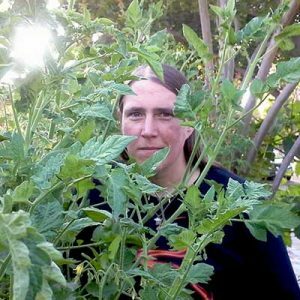 Despite being a bit unusual in its origins, these plants are actually not very susceptible to most growing problems. What few might strike I’ll detail below! Your coral cactus may be subject to reverting. 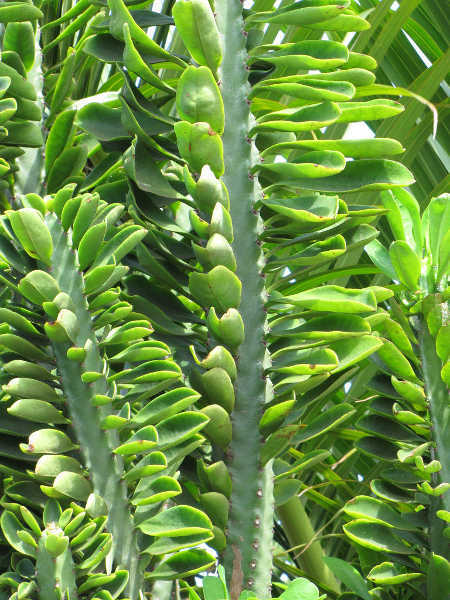 Reverting is when the Euphorbia neriifolia rootstock decides it wants to try to redevelop as a neriifolia, creating a secondary stem or stalk that shoots up next to the lactea crown. If this happens, you have the choice between leaving it and having an even more unusual plant, or removing it carefully near the crest and allowing the latex to scab over the cut portion. It should not harm the crown either way. Coral cactus is immune to a lot of pests, as the latex tends to be a deterrent. However, there are still a few which might strike at your plant. Mealybugs and other scale insects don’t differentiate between succulents, they go after most types. Avoid using insecticidal soaps on your euphorbias as it can damage the plant. Instead, use a cotton swab dipped in rubbing alcohol to remove these pests. Note: if using rubbing alcohol like this, it’s best to use 70% rubbing alcohol as it’s slightly more diluted. Higher alcohol strengths may cause burning of the plant’s exterior. Spider mites may also appear on coral cactus. Since insecticidal soaps aren’t an option, use a firm spray of water to remove spider mites and their eggs, and allow the plant to thoroughly dry on the surface. You may also be able to use heavily-diluted neem oil. The natural sealing properties of the latex sap will prevent against most plant diseases as it dries. It has some natural mild fungicidal benefits as well. However, there are still a couple problems that may arise. Powdery mildew, while uncommon, can occur if your plant’s in humid conditions with reduced airflow. It’s best to avoid the conditions that can cause powdery mildew, as some fungicides will damage the coral cactus’s leaves. If powdery mildew makes an appearance, dilute one tablespoon of baking soda in a gallon of water. You can use that to treat the plant’s surfaces. Root rot can develop if the soil is too wet for your plant. To avoid this, be sure to use a cactus potting mix and do not overwater. It’s virtually impossible to rescue a coral cactus that’s suffering from root rot, as the damage is usually quite pronounced before the plant shows damage. Fungal rots can also develop on the leaves of your plant if it’s been damaged by cold. This usually shows as browned and mushy parts of the leaves. As described in the pruning segment above, you may be able to cut off severely damaged portions at the edges of leaves. This grafted plant doesn’t have to be a monster or beast. In fact, it’s more likely to be nothing more than a beauty in your home or garden! Have you grown a coral cactus before, and if so, did you have any problems? Share your coral cactus challenges in the comment section! What a weird but wonderfully unique looking succulent. I am already growing succulents indoors, I think Frankenstein here would be a lovely addition. Thanks for sharing! You’re very welcome! It really is a fascinating plant and can be incredibly beautiful.